Word plays on water source and type that can make up as much as 60% of the volume of a bottle of spirits can be extremely important to the flavor of the product, but don’t be fooled by gimmicks. 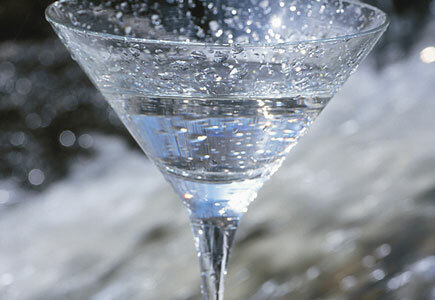 All water blended with spirits must go through a de-ionization treatment process to ensure that the water and alcohol blend properly, or they may separate. Water sources from mountain wells may, however, provide different quality water from those used from a municipal water system where treatments may have already been added. At Distilled Resources Inc., where we actually make the alcohol that we sell, the same water is used in cooking, cleaning, steam generation for distillation, and bottling, all of which comes from our 200 ft. deep well tapping into the Snake River Aquifer – and that’s the honest truth. Are all waters the same? Are all vodkas the same? …Clearly not.